A look into the final days of the troubled legend Ralph Greenleaf. IT WAS the spring of 1946, approximately three months after his last-ever competitive appearance, and the great Ralph Greenleaf had inexplicably vanished. Amelia Greenleaf said her husband had gone AWOL before - but never like this. She said he'd go off carousing with friends or playing exhibitions. Eventually he always turned up. But Amelia had received no communication whatsoever from Ralph. In a panic, she filed a missing persons report. "I am worried about his safety," she told the police. Not long afterwards, Ralph Greenleaf appeared in a seedy poolroom in Boston, filthy and unshaven. He also had taken up residence in an area flophouse. Greenleaf may have fallen into drugs. He was almost wholly unrecognizable. Welcome back to Untold Stories. I'll attempt in this month's installment to reconstruct a few weeks near the end of the great Ralph Greenleaf's life. The information is mostly based upon the eyewitness account of an ex-Navy man, one Harold Houle, who tells us that he came upon the broken-down champion at a dockside poolhall. He remembers Greenleaf as an utter train wreck of a man, volatile, out of control, and - apparently - very much homeless. It's unclear whether these ragged days correspond to that period when Greenleaf's wife had reported him missing. It's possible, but not certain. What's clear, however, is that in these stories the utter desperation of the former champion shines through. Like our contradictory sport itself, Greenleaf was a glorious but tragic figure. Harold Houle, now 85, said the time he spent with Greenleaf came during the late 1940s, or possibly in 1950. (Houle's memory is somewhat hazy on the point.) For this column I've also spoken to BCA instructor Tom Simpson, who graciously put me in contact with Houle. I also reviewed newspaper clippings from The New York Times, and I've drawn a bit from my book, "The Hustler & The Champ." But as always, let's start with a bit of context. Ralph Greenleaf was born on Nov. 3, 1899 in Monmouth, Ill. He was the youngest-ever straight-pool world champion, having prevailed for his first time at age 19. He then continued winning for the next two decades, having amassed 14 titles in all. Only Willie Mosconi is possibly considered a greater player - and I stress possibly. It has often been said that the bottle was Greenleaf's greatest adversary - but even when drinking, Greenleaf typically bested world champions. He won titles in 1919, 1920, 1921, 1922, 1923, 1924, 1926, 1928, 1929, 1931, 1932, 1933 and 1937. Evidence suggests he was probably drinking or drunk during some of those title runs. 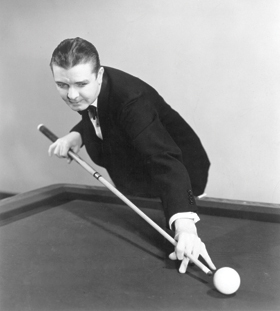 Greenleaf was also one of the first inductees into the Billiard Congress of America Hall of Fame. As noted above, The New York Times reported that Greenleaf had gone missing from his home in 1946, which was about four years prior to his death. But as his wife then told the newspaper, this was not the first time that she'd lost track of Ralph. In 1935, for instance, the champ was supposedly picked up for vagrancy in the small Oklahoma town of Okmulgee. According to the now famous story, Greenleaf was only able to prove his true identity after the jailer escorted him to a nearby poolroom, where he then ran 86 balls consecutively. Now keep in mind that in 1935, Greenleaf would have been near the height of his fame. He would already have won the world championship a dozen times. And at the time, the public truly cared about pool. And yet the Oklahoma cops figured Greenleaf for just another Depression-era bum. This should give you an indication of the gloomy depths into which pool's most tragic icon could plummet. And so with this Oklahoma story as context, Harold Houle's tale of a chance encounter with Greenleaf at a Boston poolroom doesn't seem the least bit far-fetched.